The aging process depends primarily on the condition of your arteries. If you remember nothing else I have said thus far, remember this: your arteries play a monumental role in the physiological aging of your body. 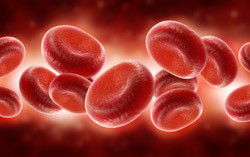 The flow of blood through your body carries nutrients, oxygen, electrolytes, and other essentials that keep the body running like a new engine. That blood is pumped through your system by the heart and is carried by sixty thousand miles of arteries, plus veins. The condition of the arteries determines how well the body is supplied with all it needs to function at 100 percent. As those arteries become damaged by certain cholesterol particles, the walls begin to respond by developing a battlefield to fight those foreign bodies, and either plaque buildup or inflammation results in a clot. Both events can cause the blood flow to either completely stop or become markedly decreased. The down- stream area becomes starved for oxygen. If the heart is involved, a portion of the muscle quits working and the remaining fibers are called on to carry an extra load of pumping your blood. The result is a less effective pump. If the affected organ is the brain, that portion of brain tissue supplied by that particular artery quits working. If it is sudden, you have a stroke in which the part of the body supplied by that portion of the brain quits working immediately. If it is a slow blockage process, you could end up with what is called dementia, and slowly, over the years, you begin to forget, function slower, lose your reasoning, and finally lose your memory. The blockage process in an artery begins with certain cholesterol particles floating in the bloodstream. At different locations, usually where the artery divides or branches, there is turbulence in the blood flow. In such areas, these particles are pounded into the wall of the artery. They are forced through the inner lining and end up implanted within the wall. As time goes by, many more of these minute particles continue building up, and your body sends in special cells and a flood of fluid to begin fighting off these foreign bodies, which, of course, are not supposed to be there. The result of such a battle is a partial or complete blockage. If it goes on long enough, even calcium can be deposited into the plaque formation. This is a silent process. It doesn’t cause you any pain. It doesn’t give you a headache or make your chest hurt. It works quietly while you order extra cheese on your hamburger. Most people don’t understand this process. You are getting ready to know exactly what is going on. I believe if you were standing in the middle of the railroad tracks and a freight train was coming, you would jump out of its way before it ran you over. I’m sounding the alarm so you can avoid that train with your health. When we finish, you won’t be able to plead ignorance. You can do specific things every day for the rest of your life that will keep those blocking particles out of your bloodstream and those arteries youthful. Let’s look at the layers of an artery and see what happens when you eat the wrong foods. The thin inner layer is called the intima. Think of it as the protective portion of the arterial wall. It should be capable of keeping anything from getting through the inner lining and into the wall of the artery. Picture it as being made up of individual pieces of a thousand-piece jigsaw puzzle, each piece with a Teflon coating. This makes it smooth and slick, and nothing sticks to it or penetrates it. If you could magnify the intima, you would see that each of these interlocking cells is held together by little proteins, locked arm in arm. Think of these proteins as a line of soldiers that will not let anything penetrate through this lining. Now let’s go through that very thin inner lining and look at the next layer. This thicker, spongy layer is called the media. This is where the fighting takes place. Think of the media as the battleground of the aging process. This is where all kinds of things happen that determine whether you stay young or get older ahead of your chronological time frame. Even though so much fighting takes place in the media, the big problem is that we don’t feel anything while the battle is going on. If you were to hit your finger with a hammer, you would make all kinds of fuss. You would make sure that would never happen again. You would see the place the hammer hit immediately begin to swell. You most likely would put ice on it and elevate it to help prevent more swelling. But the problem with the damage that goes on in your arteries is that you are completely unaware it’s happening, and you let it happen again and again. Finally, we come to the outer layer, which is a thin, smooth covering that is fairly firm but pliable and doesn’t really play a part in any of these problems. Think about it a minute. If your arteries begin to age, you age. If you protect your arteries, you will, physiologically speaking, stop the clock. You can even turn your physiological age back quite a few years with some basic lifestyle changes that you can maintain the rest of your life. Heart attacks, strokes, dementia, and erectile dysfunction are all caused by not protecting your arteries with a proper lifestyle. The same blockage happening in your heart is happening in the arteries to your kidneys, to your intestines, to the muscles in your legs, to every part of your body. You may have absolutely no symptoms of blockage in your arteries, but I assure you that you have cholesterol deposits building up in your arteries. By the time patients present with EKG changes, or chest pain, or numbness going down their arm, it has already happened. We see the same thing with brains, when patients present with weakness, or numbness around their mouths, or dizziness. It’s an ongoing process because of your eating habits. Many of these arteries are already 95 percent blocked. I have operated on many carotid arteries, the two main arteries going to the brain. Some have been 90 to 95 percent blocked without the patient ever having any symptoms. Their doctor just happened to find the blockage in a routine physical examination. Don’t wait for symptoms caused from the blockage of your arteries before you do something to prevent a stroke or heart attack. And for you men, the same goes for erectile dysfunction. Don’t wait until it happens to decide you are going to protect your arteries. 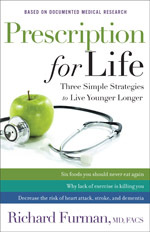 Get specific steps you can take to protect your arteries in Prescription for Life. Yes, you can live younger, longer!